It seems like people always put the word “Hard” before the word “Maple”. So when people tell me they have a nice “Hard Maple” log, I think it is really probably “Soft Maple”. Because that is what I find when I cut into the log. Real Hard Maple needs to be species Acer Saccharum. Which is commonly known as Hard, Rock or Sugar Maple. Soft Maple is Silver, Red, Striped, Bigleaf Maple or Box Elder. I like the figure in Hard Maple. It makes nice spindle turnings. Soft Maple does not thrill me. But, In general, I don’t like Maple because it is to hard to sand and people always give me ugly Soft Maple. I found a nice “Wood Database” article on the web that explains the difference. 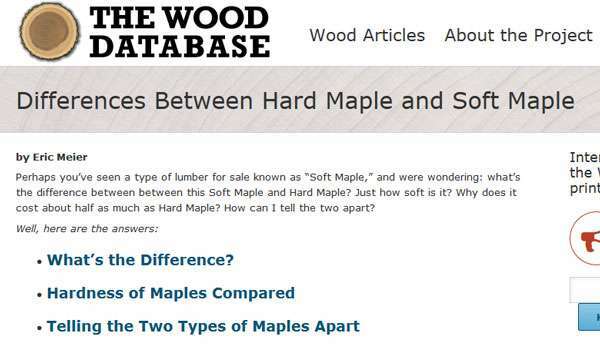 “Differences Between Hard Maple and Soft Maple”. Click here for web. Click here for PDF. The Wood Database has some other interesting articles here. Like “The Ten Best Woods You’ve Never Heard Of”. The Wood Data Base is a very interesting web site. Thanks for turning (pardon the pun) me onto it.